A client runs a membership based website which he uses to broadcast regular live webcasts. During a live webcast he invites comments and questions from his audience. 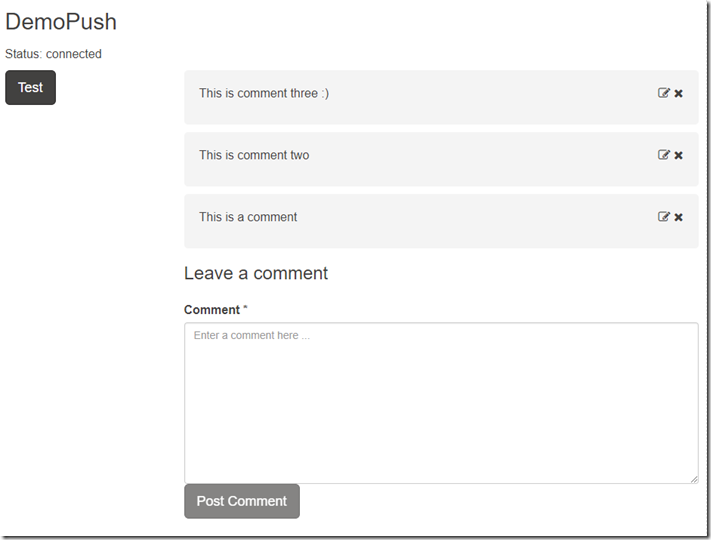 His current site, running on php, does provide the functionality to allow posting of comments/questions. The problem with the current site is that the page is refreshed on a timer and this does not work very well. I am in the process of building a new site, based on DNN, and sought a better solution for comments. With this in mind I posted a “cry for help” on facebook: https://www.facebook.com/declan.ward.100/posts/10155491328449371 Many friends responded with suggestions but the solution I decided to try was offered by Joe Brinkman; WebSockets. Joe’s suggestion turned out to be a perfect solution for my requirement. In this blog post I will walk through the steps to a working solution. To start we need a basic module. I use a template, created from Chris Hammond’s DNN Templates (https://github.com/ChrisHammond/DNNTemplates), in which I stripped out what I don’t need and added what I do need. The project is located in DesktopModules and NOT DesktopModules\MVC. Add a folder named WebApi. 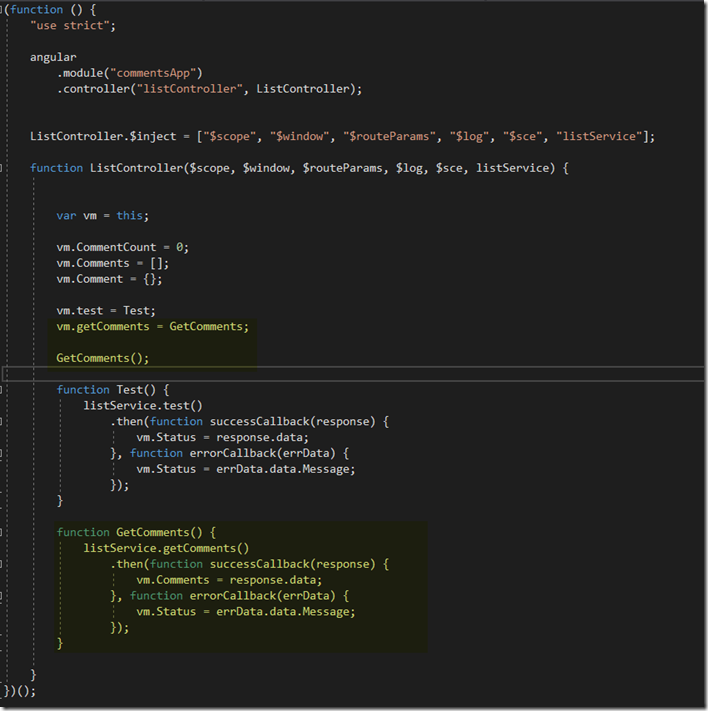 Add a class CommentController to the folder WebApi. You will need to inherit from DnnApiController and add some references and using statements. One more class is required before testing. In order to gain access to the API we need a route. 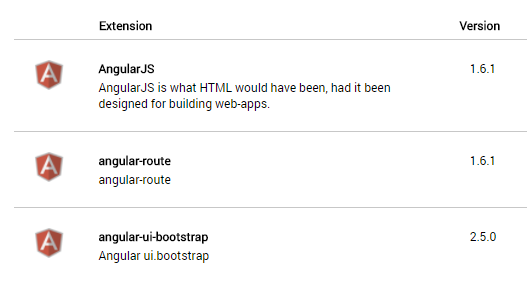 This is handled in a class named RouteMapper as shown below. Compile the module in Release mode and install it in the normal manner. Test the module API by browsing to the site. In this case the development site is at http://dnn9 and the route to the test method is http://dnn9/API/demopush/comment/test. The Url to your development / test site may be different. We also need a service , controller and list template for comments. This is simply a button to call the test method and a resulting status. 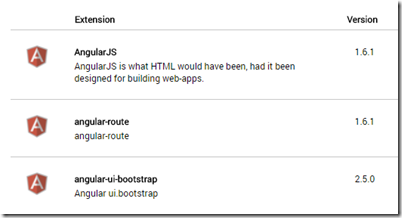 There is only one route in this case but multiple applications in this module would require additional routes to different controllers and templates. You now have the basic angular module working. The table definition below shows the data model used in this demo. Add a new class named CommentInfo to the Models folder. Add a reference to System.Runtime.Serialization. 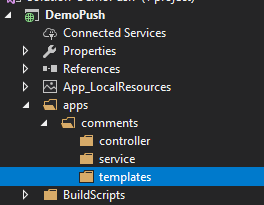 Add a controller for the CommentInfo class, named DbController, to the Controllers folder. The code below includes a method to get all comments. 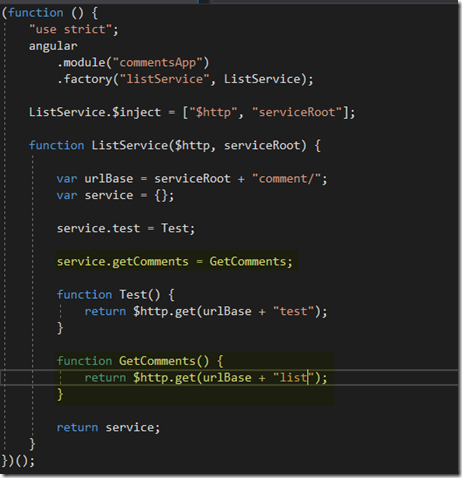 In WebApi\CommentController.cs add a get action named “list” to retrieve all comments. 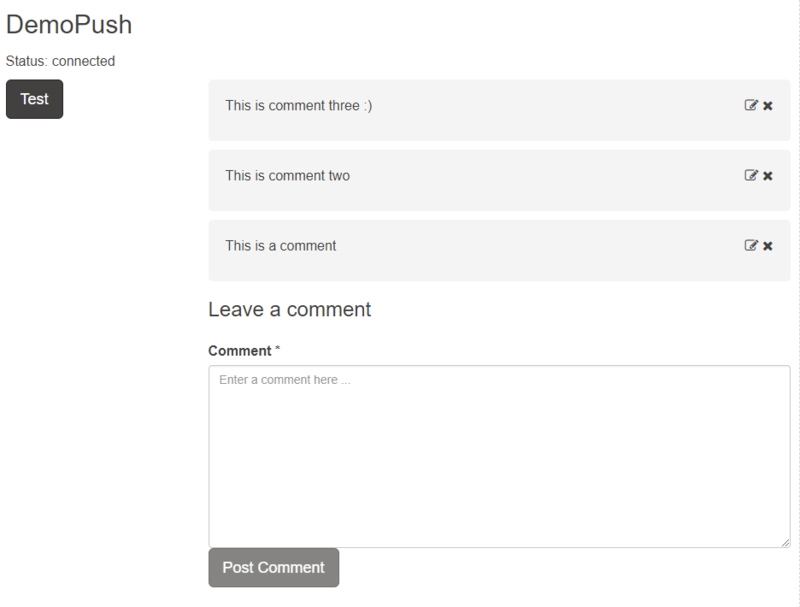 Browse to http://dnn9/api/demopush/comment/list and you should see a list of any comments you added to the table. Once happy that the back end is providing the data needed, you need to add code to get and display the results to your users. 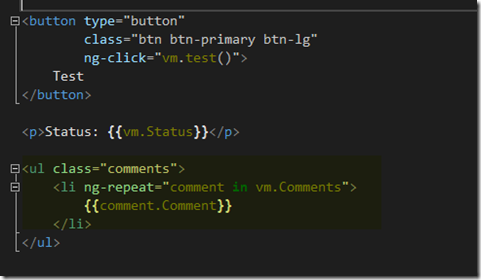 GetComments() places all comments from the WebApi into an array vm.Comments. 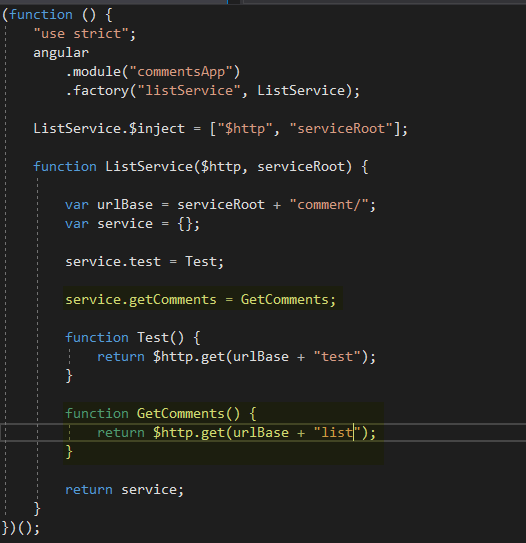 Displaying the comments is as easy as adding a list with a angular ng-repeat command to iterate through the array of comments returned by the API call. Use NuGet Package Manager to locate and install Microsoft.WebSockets. Websockets will be used to handle adding, editing and deleting of comments. To the Models folder add CommentSocketAction and ErrorSocketAction classes. These are used to pass data between server and client. Of note is the foreach loop which sends a message to all clients that have connected to the module. This is where the magic takes place. When a user adds a comment, all users connected will immediately see the update. Add some code to DbController to handle inserts to the database. Code for a new comment is shown below. You can add similar for update and delete. listController.js will contain the code to communicate with the server using WebSockets. vm.wsID = 1;    // in demo an id is passed into WDApp function - where does this come from ? A comment id of –1 denotes a new comment, hence the use of ResetComment(). The code is relatively self explanitory. You will need to change vm.StringUrl to meet your own setup. <textarea maxlength="5000" rows="10" class="form-control" name="comment" id="comment"
Refresh your module page to load the updated files. Browse to your site with different browsers/ browser windows on one or more machines. Whenb you enter a comment on one it should immediately appear on all others. A Google search brought me to the solution at https://stackoverflow.com/questions/36940711/signalr-websocket-handshake-sec-websocket-accept-header-is-missing It was a simple matter of enabling the WebSockets protocol in IIS. lilad Nice that you came up with a solution (with help from friends) and to see the steps you took! Definitely helpful for everyone having the same problem.